I have poured My love into your heart by My Spirit. The photo of today's promise was taken at Niagara Falls. Since I have the luxury of living within 15 miles of this great natural wonder, it is easy for me to go there anytime I like. The volumes of water that pass over both the American Falls and the Horseshoe Falls are absolutely astounding. Day and night, the water continues to pour over the edge of this escarpment crashing down on the rocks below. It simply never ends. That is why I chose this photo to illustrate the promise that God continues to pour His love into our hearts by His Holy Spirit which He has given us. His love for us is a rushing river of His goodness towards us that never ends. While this truth is more real than everything else around us, it is easy to struggle to actually comprehend the greatness of God's love for us. I often feel that words fail to adequately describe His love. That is why we need the help of the Holy Spirit. In Ephesians 3, Paul prays that we would be rooted and grounded in love and that we would have power to grasp how big and wide and high and deep is His love for us in Jesus Christ. Just as we could never count how many gallons of water are rushing over Niagara Falls every second, we cannot measure the love that God is pouring into our hearts by any natural means. The only way we can hope to fathom the eternal, everlasting, never ending love that God has for us is by the Holy Spirit which He has given us. Today, why don't you ask God to give you power to grasp the vastness of His love for you? 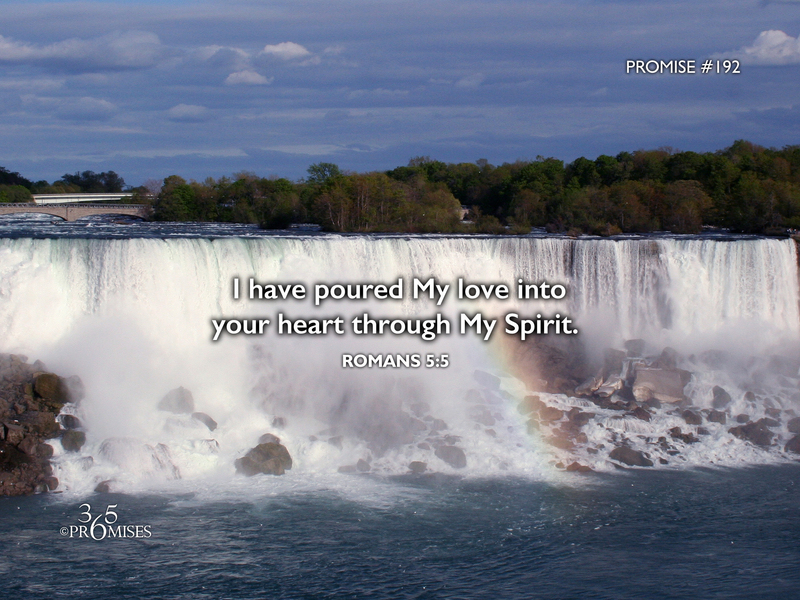 For it is through His very own Spirit that He actually pours His love into our hearts 24 hours a day, just like the raging waters of Niagara Falls.